I moved to a new area that didn't have DSL from either PLDT or Globe. I temporarily used pre-paid wireless Internet that gave me unreliable speeds and quality of service (QOS) problems. When I heard that Globe had WiMax capabilities in my area, I went to their SM Mall office and filled out an application form for their 1mbps plan ($25 USD/month or 995 pesos/month). Within two days of paying their P500 setup fee, they were able to install an antenna, a HUAWEI Echolife BM622 WiMax-certified "modem" (more like a router), and a 15 meter cable that connects the antenna to the modem. The setup was fast. I was on the Internet the moment the modem was turned on. At first, the connection speeds recorded by speedtest.net ranged somewhere in the vicinity of 500kbps. After sending text messages to the technician to make sure I'm provisioned at 1mbps, it was resolved and I was able to record 1mbps speeds consistently about 36 hours later. 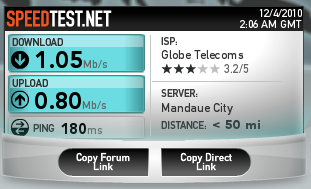 In my previous residence I was using Globe DSL and I have to say, Globe's WiMax offering seems to be more reliable. Globe DSL always had quality of service issues, consistent lag or packet loss where as the WiMax seems to be more reliable in that regard. This is "my case" and you may experience something different in your area, especially if you live in an urban city like Metro Manila that may not have clear line of sight signals from your nearest Globe tower and you would probably fare better with fixed wired connections. Can you use a wireless router with Globe's BM622? In fact, I turned on my XBox's wireless adapter add-on and I was able to logon to XBox Live (after almost 1.5 years of inactivity). I like it, I'm a fan, and I encourage others who want stable Internet at home to try this out. I have always been a skeptic of wireless Internet delivered via cell towers, especially after my earlier experiments with AT&T's wireless data services in the U.S. almost five years ago. But when you are desperate for a stable Internet connection, you'll try anything -- even wireless Internet again. I'm pleasantly surprised that the much advertised technology upgrades of wireless Internet via 4G is actually true for my case. The new WiMax service outperforms SmartBro's 3G USB modems and even Globe's own 3G USB modem. That's the nature of the beast, they are just different technologies and you have better signal strength with physical antennas being screwed on top of your roof. what changes did you make at your qos settings? need help to improve my wimax.. thanks! email me at haroldhex@yahoo.com..
@jenel.., Is your Globe wimax still in used?? if it is disconnected Im buying it for a price.. bobjerrynavarro@y.c.